Boost your brain power naturally! Try this simple intervention to reduce depression, stroke, heart disease and improve cognition. Does that statement make you a bit wary? A recent meta-analysis of 22 studies spanning two decades finds that the Mediterranean diet is associated with significant reductions in the risk of depression and stroke, and significant improvements in cognition. Across the studies, in those people who were “highly adherent” with the diet there was an overall 33% reduction in risk for depression, a 40% improvement in cognitive function, and a 30% reduction in risk for stroke. To put that in context, antidepressants appear to reduce depression by about 33% more than placebo (overall reductions are about 55%), and daily aspirin, which is often recommended to women to reduce their risk of stroke, is associated with about a 17% reduction in risk. The Mediterranean diet is characterized as high in vegetables, fruits, nuts, and seeds; moderate in fish, poultry, eggs, and olive oil; and low in red and processed meat and saturated fats. There are many theories about why the diet helps. Among the theories are that it may be due to the anti-inflammatory or antioxidant properties of the diet, or its effect on glucose regulation (it is also associated with reductions in risk for diabetes). 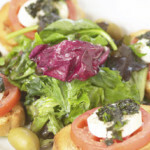 For more about the Mediterranean diet you can go to this page on our site. These books might be of interest also. Ann Neurol. 2013 Oct;74(4):580-91. doi: 10.1002/ana.23944. Epub 2013 Sep 16. Mediterranean diet, stroke, cognitive impairment, and depression: A meta-analysis. Psaltopoulou T, Sergentanis TN, Panagiotakos DB, Sergentanis IN, Kosti R, Scarmeas N.